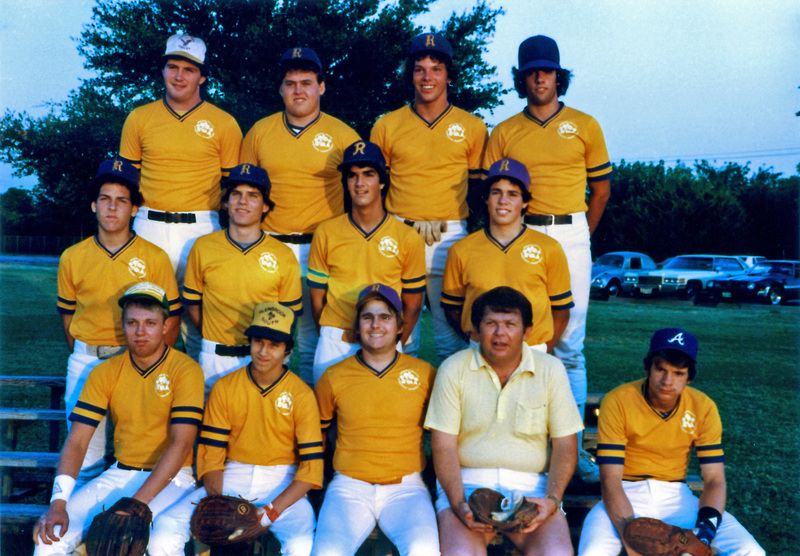 Since it’s baseball season, today’s #TBT is two pictures from my SVAA baseball team. When I was The Divine Miss M’s age, I had this fantasy that I would grow up to be a major league ball player. I was a decent player. But the truth is that I wasn’t even good enough to make my high school team. But, despite the fact that I hadn’t made the school team, and despite the fact that there seems little hope of my playing ball beyond that final year in SVAA, I hadn’t fully come to terms with the loss of this childhood dream. I still had some kind of magical-thinking going that I’d still be the next Pete Rose. A part of what kept that dream alive, I suppose, was that our SVAA team was KILLER. Even during our junior year, we were mowing down opponents. 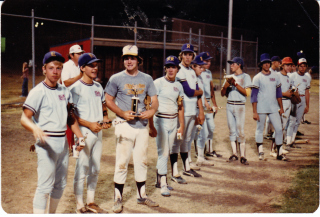 We made it to the championship game, where we faced-off against a senior team whose pitcher was headed off the A&M on a baseball scholarship months later. We lost the championship game, our junior year. But even in losing we felt confident. Next year would be OUR year. Sure enough, it was. We mowed down all opponents in the regular season. Creamed them. It wasn’t even close. We were supremely confident. We were good, and we knew it. We were the Yankees of the 30s. The Reds of the 70s. Then came the playoffs. And the unthinkable happened. We lost in the first round to a team that wasn’t nearly as good as we were. There’d be no return to the championship game. “Our year” wasn’t to be. Guy bowed the heads and cried in the dugout. I was as stunned as anyone. As I walked in the doors of that empty house, the magical-thinking suddenly fell away into the shadows of those empty rooms. I realized something final was about to happen. I was about to take off a baseball uniform for the last time in my life. I did. And I cried buckets of tears, alone. A few weeks later, we had a final party with the guys at one of their houses. Lots of beer. Lot’s of talking about college. Then we all went our separate ways. A few of these guys are on Facebook now. But I don’t keep up with most of them. So, as I’m writing this, I’m thinking about Maria, and how much I yearn to keep her from anything heartbreaking. I HATE to see her sad about anything. And, luckily, it doesn’t happen that often. But looking back now, it’s clear that losing an early dream like that, even as improbable as it ever was, was a gift. Like baseball itself —where the greatest of the greats fail 65 percent of the time— that loss was a teacher. It helped me realize, early in life, that you always have far more options than you think you do. Even when big dreams fall away, or when fantasies do, there’s always so much more ahead of you. Man, I’m grateful that I was once a Boy of Summer. But I’m even more grateful for everything that happened after that, which I couldn’t have possibly fathomed on that night I pulled that tear-stained uniform off for the final time.